Ok, I just spent one half hour making a map to put here offline, then had to download the drivers for my flash drive, because 50 to 70 percent of the time they do not have windows XP, then I had to download winzip to unzip my drivers, then load in the drives, then upload Cute FTP... I get all the blog photo s published and I accidentally deleted the correct graphic, and left the wrong one. The internet in the world is a challenge. Map of my rendition of river systems of South America, I look for possible travel routes. This is the map that I drew trying to explain the former post about me thinking way too much about rivers in South America. I suppose go down a couple and read the post and this map with make more sense. I really did not have much desire to go to Rurrenabaque, Bolivia, however it was one of them ticks on the list of places you are suppose to go, or maybe you could go, I heard there were alligators, however I only seen pets and one alligator. However, I am very obsessed with the idea of traveling from the farthest point of the Amazon water system down somewhere to where I have been before, I would also like to go to Belem, Brazil to smell around to see smugglers and hopefully some really culture clatter, I think Belem is a big city, however that does not mean outside the city there can not be some real crazies. Obsessions are interesting, I am full of enigmatic quandaries that drive everyone crazy but me, I am immune to my own obsessions and consider them a sport, like many sports I have, game for the mind, my play toys. I want to find a route behind or East of Cusco and hopefully from Bolivia to Iquitos Peru by river or boat. I am also interested to find the farthest point that a drop of water starts in Bolivia or South America and works its way to Belem, Brazil down the Amazon River systems. DHL Shipping does have a use! OK, so obsession, compulsive behavior, I practice so few of my addictions anymore, that life is sometimes boring, I need a good passion to drive me along. I do admit the woman of South America have a more Jungle feel about them, more basic, back to primitive. People need to go primitive to remember that sometimes monkeys are for sure smarter than Humans are. Monkeys do what they want without apologizing; people spend their whole time apologizing for animal behavior. Strange anyone would apologize for being natural and anyone would try to say things are natural that do not propagate the species, I think some people need to go…. Do something that is technically impossible to themselves. Natural, all is natural because it happens, however I do not wish to be annoyed by you, I especially do not want to hear how I you need me to listen to you while you annoy me, this seems unnatural listen to people annoy me, and pretend like I care. I try to listen to the people with real problems, they are too afraid to talk. OK, so I am trying to find the most enjoyable, best ways that will eventually evolve to trips inside of South America, maybe 50 years from now, contrary to any dream myths the world has, it is not overpopulated, there is 50 percent of the planet with nothing but land and space, the cities are overcrowded and the mice are not smart enough to leave the cage. 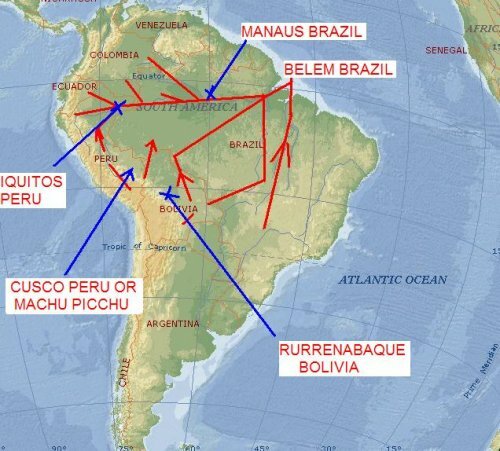 OK, there are two major river paths that need explored or opened in South America, maybe there are really four. 1. Down from Colombia to Iquitos Peru, somewhere closer to Bogotá. 2. Coca, Ecuador to Iquitos, Peru, I did this trip. 3. From near Lake Titacaca / Peru / Bolivia to the east of Cusco and to Pacalpa or Iquitos Peru, this is a great trip idea for me from Cusco to Iquitos. 4. From South of Santa Cruz, Bolivia or maybe near Cochabamba, Bolivia, I am still trying to figure out, across Brazil and open up that area for easier travel, it is probably the crazy area to reach, other than the 100 kilometers South and North along the main Amazon Corridor. The main Amazon Corridor is traveled, leave the river one kilometer and most is untouched as best I can see except for locals eating monkeys and all the animals they can kill. Thanks to Encyclopedia Encarta, a.k.a. Microsoft for that knowledge, this leads to the Amazon or is the Amazon in my way of thinking, ok, this river is down around Santa Cruz, and is not easy to figure out, that is why I say obsession, normal would quit. If you are traveling anywhere in the world, pay attention to the rivers. The rivers were the first form of transportation, then the road, or trains, so normally most cities are built along rivers for fresh water and transportation, and then come the road, and sometimes trains in South America, however not really. Therefore if you understand the rivers of a continent you start to understand separations of culture, mountains, languages and how it evolved to the present conditions, there are natural boundaries in the world.